This comprehensive book promotes high-quality research by bringing together researchers and experts in CPS security and privacy from around the world to share their knowledge of the different aspects of CPS security. 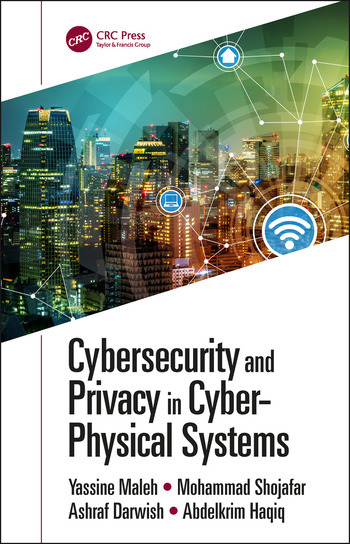 Cybersecurity and Privacy in Cyber-Physical Systems is ideally suited for policymakers, industrial engineers, researchers, academics, and professionals seeking a thorough understanding of the principles of cybersecurity and privacy in CPSs. They will learn about promising solutions to these research problems and identify unresolved and challenging problems for their own research. Readers will also have an overview of CPS cybersecurity and privacy design. Issues of Personal Information and Identity Crime in Cloud of Things. Intellectual Property-Related Issues in Cyberspace. Computer Forensic Investigation in Cloud of Things. Theory and Practice of the Internet of Things and Cloud Computing. Terrorism and the Cloud of Things. Strategic Analysis in Cloud of Things. Modeling of Telecommunications and Network Data. Personal and Corporate Activities in the Cloud and IoT. Digital Information and Data Mining in Cloud of Things. Biometrics for Data Security and Security of Personal Information in IoT and Cloud. Technology-Enabled Detection and Prevention of Cybercrime. Cyber-Profiteering in Cloud of Smart Things. Cybercrime and Digital Forensics Education in IoT and Cloud. Yassine Maleh, PhD, is a senior researcher at the University Hassan 1st in Morocco, since 2013. He is IT Security Analyst at the National Port Agency in Morocco. He is Member of IEEE Communications Society and European Microwave Association, the International Association of Engineers IAENG and The Machine Intelligence Research Labs. Maleh has made contributions in the fields of information security and Privacy, Internet of Things Security, Wireless and Constrained Networks Security. His research interests include Information Security and Privacy, Cyber Security, Cloud Computing, Internet of Things, and Networks Security. He has published over than 20 papers and 2 edited books, "Security and Privacy Management, Techniques, and Protocols" IGI Global and "Security and Privacy in Smart Sensor Networks" IGI Global. He has served and continues to serve on the executive and technical program committees and a reviewer of numerous international conference and journals such as IEEE Sensor Journal, International Journal of Security and Privacy, International Journal of Networks Security and International Journal of Sensor Networks and Data Communications.